Zulu Beadwork is a traditional skill that has been passed down from generation to generation. The handmade beadwork is unique in its patterns and colours, and historically was used as a means of conveying feelings and messages. The beadwork is generally done by Zulu woman who work from their homes which enables them to combine their craft work with their normal routines eg looking after children, cooking, tending crops and other daily chores. 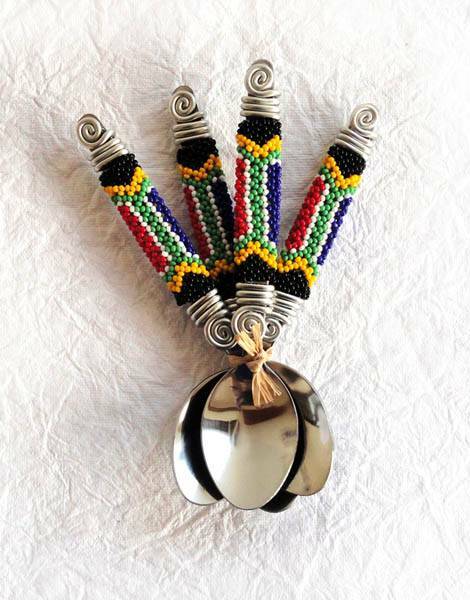 They have taken the traditional skill and converted it to create a unique and elegant beaded cutlery. All the cutlery is stainless steel and the wire used is nontoxic, non corrodible. Wash by hand only.